The Overlook neighborhood is located in North Portland, the charming "fifth quadrant" of the City of Roses, offering a comfortable urban community with easy access to downtown Portland and surrounding areas via Interstate 5. Overlook is situated between historic Interstate Avenue and the Willamette River, and has gone through many changes in its history. "The Avenue", as Interstate was once known, was the primary highway of the east side, connecting Portland with the State of Washington, and was the site of many historic hotels, restaurants, service stations, and shops with trademark neon signs. Since the growth of 99E and Interstate 5, the once-popular route has changed its character. Establishments began to cater to locals instead of travelers, so you're much more likely to see local commuters than family vans on vacation, and the identity of the area is still in flux. The Interstate area is still home to some of North Portland's favorite restaurants, diners, and bars. Overlook is a diverse community that has truly blossomed in the past few years, due to increased transportation access and the growth of surrounding neighborhoods, including the Alberta Arts District, Mississippi District, St. Johns Neighborhood, and Kenton Neighborhood. North Portland is a unique place where you'll always find something going on, from block parties to excellent live music. Overlook is situated near the Interstate MAX light rail line, so you can explore the best of Portland without a car. North Portland is quickly becoming recognized as a thriving part of the Portland culture - this "fifth quadrant" is refusing to be ignored, and you shouldn't overlook the historic charm and peaceful neighborhoods of the North in your home search. Overlook is located in the North section of Portland, Oregon. The Overlook neighborhood boundaries are N Ainsworth Street to the north, Interstate-5 to the east, N Russell Street to the south and the Willamette River to the west. Overlook is bordered by University Park and Arbor Lodge on the north, Humboldt and Boise on the east, Eliot on the southeast, and Northwest Industrial and the Northwest District across the Willamette on the west. The Overlook Park Station, the N. Prescott St. Station, and the N. Killingsworth station on the MAX Yellow Line provide light rail service to the neighborhood. Swan Island and the Mock’s Bottom industrial areas as well as the Union Pacific rail yards are all technically within Overlook. Overlook is part of the Interstate Corridor Urban Renewal Area (ICURA), Portland's largest urban renewal area. It includes a diverse collection of historic communities in north and northeast Portland, comprised of older residential neighborhoods, interconnected by commercial corridors, with large scale industrial centers. Overlook is served by several excellent public shools, including Beach Elementary, Ockley Green School, Trillium Charter School, Jefferson High School, and Portland Community College's Cascade campus. Real Estate in North Portland has been booming in the past few years, but the Overlook neighborhood has kept its working-class charm and accessible attitude. Overlook’s home styles include Portland’s classic Craftsman Style Bungalows, cottages, ranches, Old Portland style homes, and other medium-sized one and two story residences. Though many of the Overlook, Portland-area homes were built after WWII, you can still find plenty of character and charm surrounded by mature trees and amazing neighbors. To search for homes for sale in and near Overlook, Portland, check out the McDonald Group Realtor's Portland Real Estate map search. The North Portland communitiy is very restoration- and rennovation-minded, so you'll find plenty of support for your fixer-upper, including the Rebuilding Center. The ReBuilding Center is a non-profit used building materials outlet, perfect for finding everything from rough cut lumber and bamboo poles to beautiful antique fixtures and hardware. Part thrift store, part treasure hunt, and part hardware store, this is the go-to place to find salvaged building and remodeling materials. There’s a reason you see bumper stickers around town that proclaim that drivers love this place. You have to be willing to dig a little, but everything is logically located and labeled, and the staff is fantastically friendly, so you’ll be sure to find inspiration for projects big and small. Plus, the prices are so low, you’ll leave with enough to keep your home improvement muse happy for weeks. The Overlook Neighborhood Association (OKNA): OKNA is one of Portland's 95 recognized Neighborhood Associations and serves as a liaison between residents of the neighborhood and the city government. A board is elected each year, to share the various duties and areas of interest to the neighborhood including Land Use, Business, Parks & Greenspaces, Fire Risk Reduction, Public Safety and others. The Overlook Neighborhood Association welcomes everyone! The Overlook neighborhood includes approximately 3800 homes, 5800 people, a thriving industrial area and several business associations. Everyone who lives, owns property and/or who works within the boundaries of Overlook is part of OKNA. Overlook Park - N Fremont St & Interstate Ave - Overlook Park is perched up on the hill above the Willamette River in North Portland with expansive views of downtown from almost any corner of the park. This great neighborhood park includes a baseball field, basketball court, picnic area, restrooms, dog off-leash area, playground, soccer field, softball field, track, and volleyball cour, all with great views of the Willamette River. If you are interested in reserving it for a big party, you can do so by contacting the Portland Parks & Rec office. Nearby is the historic Overlook House, a gem of Portland history. Peninsula Rose Park - 700 N Rosa Parks Way - This amazing park is the perfect place for afternoon strolls through the rose garden, playing catch with Fido, or playing a game of basketball. The Peninsula Park Rose Garden was Portland's first public rose garden. As you step into the sunken rose garden, you walk through lush paths, sweeping archways and over two acres packed with nearly 9,000 traditional rose plantings. The octagonal bandstand was constructed in 1913. It was used for World War I patriotic demonstrations and is now the site for many weddings and concerts. The fountain in the center of the garden is over 100 years old. This track hosted its first race in 1961 during the Portland Rose Festival, and has become the annual Rose Cup event for the raceway. But that’s not all. They host ICSCC, SCCA, and NASCAR, not to mention the facility has a drag strip and motocross track. PIR is home to auto swap meets, drag races, and Thursday night motocross. There’s adrenaline pumping excitement for the entire family here that you just can’t pass up, especially because its right outside your door. Commonly known as the "Expo Center," this facility has become a cornerstone for the Arbor Lodge community. Over 100 events a year are hosted here, including green consumer shows, trade shows, conventions, meetings and other special events. By catering to a diverse group of regional and local small businesses, the Expo Center has positively impacted the Oregon economy and attracts an excess of 500,000 attendees annually. As far back as 1921, this site continues to present some of the largest exhibitions in the Northwest. Overlook Restaurant: This local favorite is a Greek American diner serving up great food without an attitude. It's definitely a diner as far as appearance, food options and service goes, but does not have the chain feel of a Denny's or Shari's, and you will always be able to get a table. They're open 23 hours a day (They close between 5am and 6am) everyday except for major holidays, and you should definitely try the cinnamon french toast! The Alibi: 4024 N Interstate Ave - This divey karaoke bar is known for it's tiki-themed decorations, great song-selection, and general fun environment. The Alibi is adorned in all the Tiki retro splendor your heart could ever desire. Carved Tiki heads, neon hula girls and trippy lamps - and the drinks are huge and powerful! Miho Izakaya: 4057 N Interstate Ave - This cute little Japanese restaurant is located in a historic craftsman bungalow, and serves up great asian small plates and drinks. Miho's rockabilly owner is super friendly and well-versed in Asian and Asian-esque food. Their most popular dishes are Pork Belly & Sweet Egg, Misoyaki Eggplant, Kabocha Squash, Togarashi Seared Salmon, and Ramen. Fire on the Mountain: 4225 N Interstate Ave - Best chicken wings in Portland, hands-down. The sweet potato fries are refreshing and absolutely amazing. They have a great variety of sauces - and you can try them all! At some of the tables there's Trivial Pursuit which makes for fun times with friends while you're waiting for your wings and beer. Diprima Dolci Italian Bakery: 1936 N Killingsworth St. - This wonderful Italian bakery specializes in fresh breads, pastries, cookies, and pizza as well as sandwiches, torta, sausage, bread, soups, and salads. Aficionados travel for miles for this little taste of Italy. 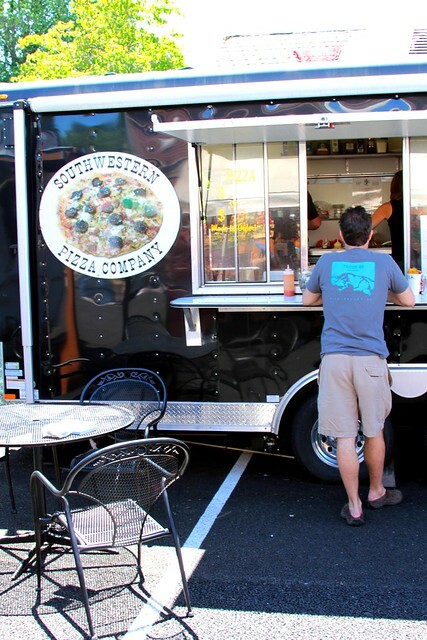 North Portland Food Carts: North Portland and the Arbor Lodge area are home to some of the best food carts in Portland. Our favorites include Flavour Spot , The Sugar Cube, The Big Egg, Moxie Rx, Native Bowl, Garden State, and The Ruby Dragon. According to Budget Travel magazine and CNN.com, Portland is the number one city in the world for street food, beating out the best of the rest. Portland’s food cart scene pulled ahead of fish tacos in Ensenada, bacalaítos in Puerto Rico, grilled-shrimp skewers and churros stuffed with dulce de leche in Rio, Belgian frites and grilled meat in Marrakech. The amazing thing about Portland’s street food is the variety. No one can pin down a cuisine or specialty dish that Portland’s carts are known for because we’ve got just about everything, from around the globe via the wackiest imaginations. We’ve got everything from Eastern European dishes, bacon and nutella sandwiches, and Korean tacos to burgers sandwiched between grilled cheeses, vegan poutine, and Carolina-style barbecue out of a truck.